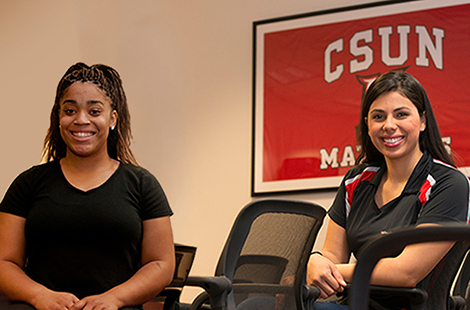 CSUN has established multiple initiatives such as the Outreach Internship Program that help local high school and community college students to learn more about the value of higher education from current CSUN students. In many cases, these prospective students are learning for the first time that a college degree is within reach. Read more about these near peer programs. CSUN campus organizations hosted the fifth-annual Cesar Chavez Service Fair to promote community involvement and honor the legacy of Cesar Chavez, whose birthday falls on March 31. Read more about Cesar Chavez Service Fair. Elaine Berke’s generosity and philanthropic spirit led to the Michael D. Eisner College of Education’s Berke Assessment Clinic and Library. The Berke Assessment Clinic and Library serves local residents by offering low- or no-cost learning assessments to children with learning differences. Read more about Elaine Berke. Tue., March 31, 2 p.m. Sat., April 18, 8 p.m. The faculty and students in CSUN’s music department will be in “fool swing” to raise money for student scholarships. Find out how cyber security affects business security, learn the latest trends in the field and uncover how to get your foot in the door. Two CSUN students were recently awarded the first-place prize for The Miller Ingenuity Challenge, a national competition aimed at encouraging more individuals to pursue careers in the manufacturing industry.